The LÄSSIG bandanas olive made of ultrafine woven cotton are the mobile solution for baby's first teeth due to a silicone teether attached on the side. 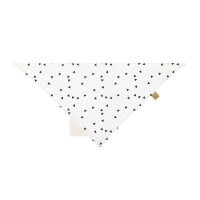 Product information "Interlock Bandana with silicone teether, Little Spookies Olive"
description & equipment The LÄSSIG bandanas made of ultrafine woven cotton are the mobile solution for baby's first teeth. The bandanas have a silicone teether attached on the side that has a soothing effect for teething. Inside the material is a water resistant layer that keeps the child's clothes underneath the scarf dry. These reversible bandanas are available in different designs, with a pattern on one side and a solid color on the other. All bandanas include snaps so that they can be adjusted individually to the child for a comfortable fit and for easier attachment and removal. Booooo! The sweet, ghostly Little Spookies baby collection charms the little gourmets. The cute little ghosts decorate children's tableware, bibs and muslin cloths. The design is available in the two colors olive and peach.